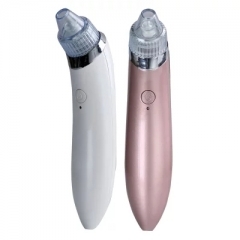 MR800F adopts the working principle of "vacuum pressure tight skin and lean face", that the unique vacuum suction system, can massage skin gently, improve blood and lymphatic circulation, promote metabolism, make skin tissue get sufficient nutrition supplement, make skin more compact and glossy, and enhance skin penetration. The beauty liquid can penetrate deeper into the skin tissue, thus improving the moisture of the skin and making the skin more bright. MR800F black head blackhead removal tool microcrystal probe has more than 100 thousand natural mineral microcrystalline diamond particles, and sucking the blackhead can effectively make the cuticles and rough defects loosened and fall off, avoid excessive accumulation of dead skin cells, keep the skin smooth and tender, and glow young brilliance. The suction hole black head instrument has large suction head and can be used for blackhead and V-shape face. Black sucking device with small round holes to absorb blackheads and acne, and tender skin are suitable. 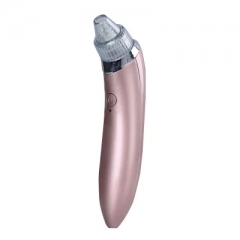 The oval suction hole is used to increase the elasticity of the skin, and the absorption of blackheads is mainly aimed at small fine lines. Skin beauty: with a microcrystal grind plate, the cuticle and dead skin tissue on the skin are worn off. The body will be translated as a slight damage, and then the new healthy cells are banned to solve various skin problems. Suction power: the use of suction, can effectively remove the pores of the black head, grease and dead skin, and stimulate the dermis self collagen proliferation, improve skin quality, make skin more elastic. Absorption: there is no barrier to cuticle. Skin care products and essence can be effectively absorbed by the skin. The efficacy of skin care products and essence can be increased by 20 times. Real time effect: clear cuticle and dead skin tissue, remove black head and fat, skin care products and essence are more effectively absorbed by skin, and stimulate collagen regeneration, skin can be more luster and tender after the first course of treatment. 1. This product is suitable for the face. 2. Negative pressure tight pull molding function, not suitable for scarring and various skin diseases. 3. Microcrystalline grinding and removing dead skin function, do not use more than 2 times a week. 4. When using, do not press the suction head over the skin. Do not use more than 5 minutes for each part. 5. After using this product, the phenomenon of reddening on the face is a normal reaction, it usually will disappear naturally after 5-10 minutes.